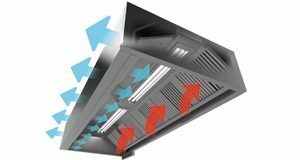 HFPD exhaust hoods come complete with high efficiency cyclonic filters. Filters exploit centrifugal force to extract grease particles with efficiency of up to 95%. Filters are made completely from 0,8 – 1 mm thick stainless steel and have a fully closed rear side. The design reduces fire hazard and ensures that highest fire-safety standards are met. Large number of accessories available, including recessed LED luminaires.